If you feel like City Hall is not listening, it’s time to subscribe to our “4 to Explore” newsletter for North Seattle in addition to the Wedgwood Echo. Founded four years ago, “4 to Explore” covers issues and events from Wallingford to Wedgwood. No ads and no holding back. Legendary urban thinker Jane Jacobs quickly discovered that City Hall often ignores individual neighborhoods. “Sometimes the city [government] is not the potential helper, but the antagonist of a street…” she wrote in her seminal work The Death and Life of Great American Cities. To get City Hall to listen, she concluded, neighborhoods need to unite across larger sections of the city, which she called “districts.” “A district has to be big and powerful enough to fight city hall.” While city residents now elect seven of the nine Councilmembers by district, the communities frequently need to unite their voices after the elections in order to influence the actions of the leaders they elect. Jacobs found that civic efforts united across multiple, connected neighborhoods “swung weight precisely because they represented opinion, and opinion makers, at district scale” (emphasis added). 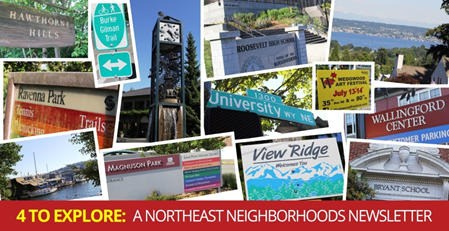 The good news is that our “4 to Explore” newsletter works to unite 15 neighborhoods from Gas Works Park to Magnuson Park. At “4 to Explore” we listen to you and amplify your voice! We recently distributed our annual survey about local issues to thousands of frequent voters in Northeast Seattle (portions of City Council Districts 4, 5, & 6 and State Legislative Districts 43 and 46). Thanks to all who participated! We know you have busy lives, so we deeply appreciate all of the heart-felt and hand-written notes. The one question with the most overwhelming response was about Impact Fees that could enable urban growth to pay for growth. As with our previous surveys, at least 85% of respondents said real estate developers should be required to pay “Impact Fees,” to help defray the costs of building new schools and other infrastructure as the city’s population grows. Even though allowed by State law and charged successfully throughout the nation (including 75 Washington State cities such as Bellevue), City Hall has refused for years even to consider Impact Fees. 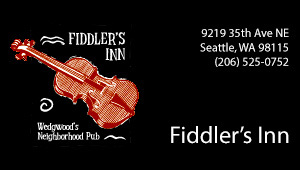 Many Seattle officials were simply afraid to offend the developers who directly or indirectly funded their campaigns. But, thanks to the recent drumbeat of support from voices across the city, three City Councilmembers recently announced their interest in Impact Fees. Many for-profit real estate developers — who obviously have a financial self-interest to avoid any new fees — typically claim that Impact Fees will raise rents. This is false. Developers charge the maximum rents that the market will bear; if construction costs increase, they cannot simply pass those costs onto the new tenants when they open their new building. Moreover Impact Fees are for new buildings only and, therefore, do not affect existing buildings. Several Seattle studies have shown that projects can absorb additional fees (click HERE, HERE, and HERE) to address the infrastructure impacts they are creating. Moreover, cities can structure Impact Fees to address affordability and feasibility concerns (click HERE). Sadly, City Hall’s short-sighted refusal to impose Impact Fees during the current building boom means we have already lost an opportunity to boost public education. That’s because collecting Impact Fees from the cranes dominating Seattle’s skyline during the past 5 years could have already built new schools to provide relief for children and teachers crammed in our overcrowded classrooms. This is a stark example of why residents need to unite across neighborhood boundaries — to show our solidarity over shared values, such as having city officials care less about developer profits and more about public schools. For our next issue — which will include 4 things City Council should do to listen to its residents — subscribe by CLICKING HERE. For more frequents posts of events and issues, follow us on Facebook and/or Twitter. Engage, have fun. Enjoy exploring. Alex Pedersen, a Presidential Management Fellow at HUD during the Clinton Administration, is a former Legislative Aide for the Seattle City Council and publishes the Northeast Seattle newsletter www.4toExplore.org.